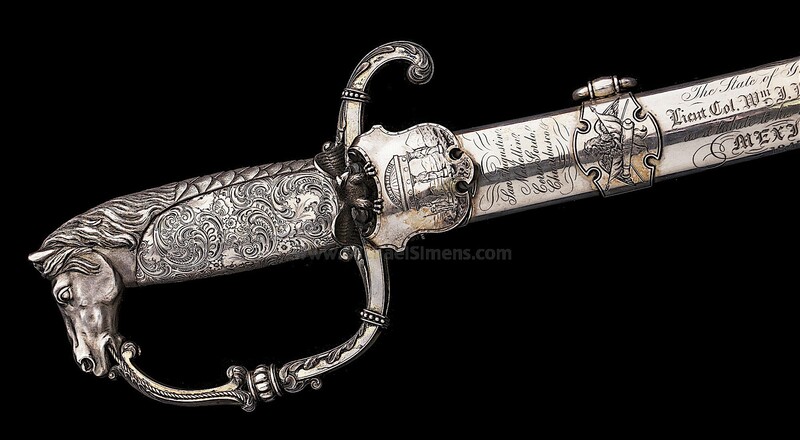 This is one of the most attractive and important Confederate Swords that has ever come to market. It is a virtual miracle that it's not in a museum. Rather, it has been in the Hardee family since his death in 1873. I purchased this impressive, solid-silver Horse-Head Saber directly from descendants of General Hardee several years ago and only a handful of close associates have ever laid eyes on it. It is possibly the last of the Great Horse-Head pommeled swords ever created, and an impressive work of art in weaponry form. William J. Hardee was born in in 1815, in Camden County, Georgia. He began his military career after graduating from the Military Academy at West Point in 1838. Assigned to the Second Dragoons, he was promoted in 1839 and 1844, respectively, to first lieutenant and captain. His service was in Florida until 1840, when he was sent to Europe as a member of a military commission to study the organization of European cavalry, attending the cavalry school of Sauinur, in France. Afterwards he served with the army of occupation in Texas, and then, in the Mexican war. He participated in the siege of Vera Cruz, the battles of Contreras, and Molino del Key, in the capture of the City 'of Mexico, and in various minor affairs. He was mentioned in dispatches, was complimented in official reports for gallantry and skillful handling of troops at Molino del Rey, and was twice brevetted—to major and lieutenant-colonel, respectively, for gallant and meritorious conduct. 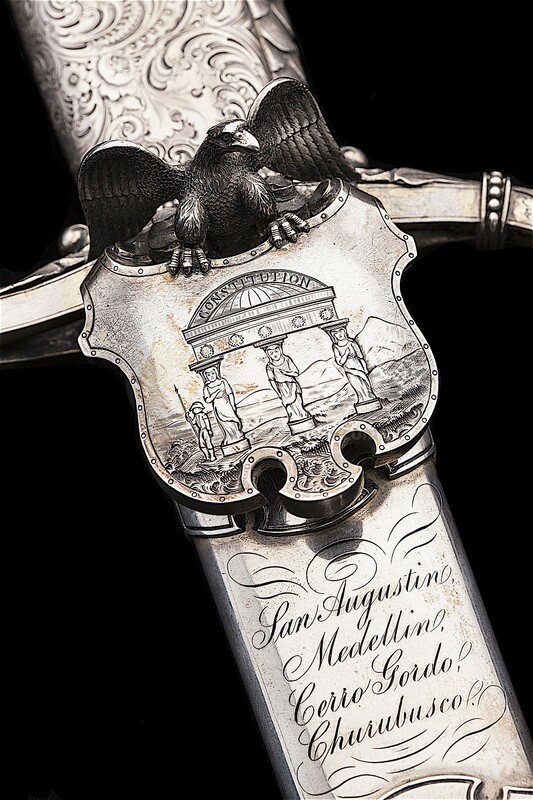 For his gallant services, the State of Georgia also bestowed on him this sword of honor, in recognition of his service in the Mexican war. Later on he was selected by the secretary of war to compile a system of rifle and light infantry tactics, which was adopted in 1855 for the use of the army, and was henceforth known as "Hardee's Tactics", a staple publication carried by virtually every officer of the Civil war, both North and South. In 1855 Hardee was assigned to the famous Second Cavalry. In 1856, with the local rank of lieutenant-colonel, was appointed commandant of cadets at the Military Academy of West Point, which position he occupied until September, 1860. Meantime he had been appointed lieutenant-colonel of the First Cavalry, and was absent on leave in Georgia when that state passed the ordinance of secession. In 1861, William J. Hardee left the United States Army after twenty-five years of service and became a colonel in the army of the Southern Confederacy. Like Stonewall Jackson and James Longstreet, he was to become one of the outstanding corps commanders of the South. During the war, Hardee rose in rank rapidly and emerged as a key figure in the Army of Tennessee, establishing an impressive combat record, rising to the rank of Lt. General and being offered total command of The Army of Tennessee, which he deferred to his higher ranking friend, Joseph E. Johnston. He broke the Union's lines at Shiloh, Perryville, Murfreesboro, and Atlanta, and saved the army from destruction at Missionary Ridge. He trained his best friend, Patrick Cleburne (best man at Hardee's wedding), making him one of the great Corps commanders of the South. During the last months of the war, Hardee commanded troops during the Battle of Jonesborough, and went on to command the Department of South Carolina, Georgia, and Florida. He resisted the much larger armies of Union General William T. Sherman, during "The March to the Sea" but was forced to give up both Savannah and Charleston. He took part in the Battle of Bentonville in North Carolina, and surrendered to Sherman along with Joseph E. Johnston on April 26, 1865. After the war, he returned to the life of a planter in Alabama, and was generally seen as one of the Confederacy’s best corps commanders. He died in 1873, never able to engage in the "self promotion" campaigns that other CSA officers railed upon. He was truly one of the great commanders of the Confederacy. The sword itself is a product of Horstmann Brothers, as the blade is marked with their name with a New York address. 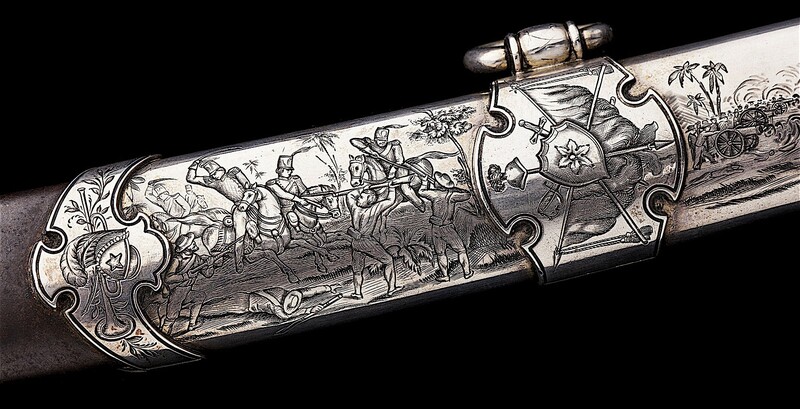 The solid silver mounts were probably designed and executed by Ball, Tompkins and Black, one of the great New York silversmiths of the day who worked with weaponry. As pictured here, the mounts are large and spectacular, with battle scenes of infantry, cavalry and artillery, carved patriotic eagles, the seal of the great State of Georgia, battle honors and impressive presentation, all in solid silver. The massive and heavy, horse-head grip with flowing mane is also impressive. 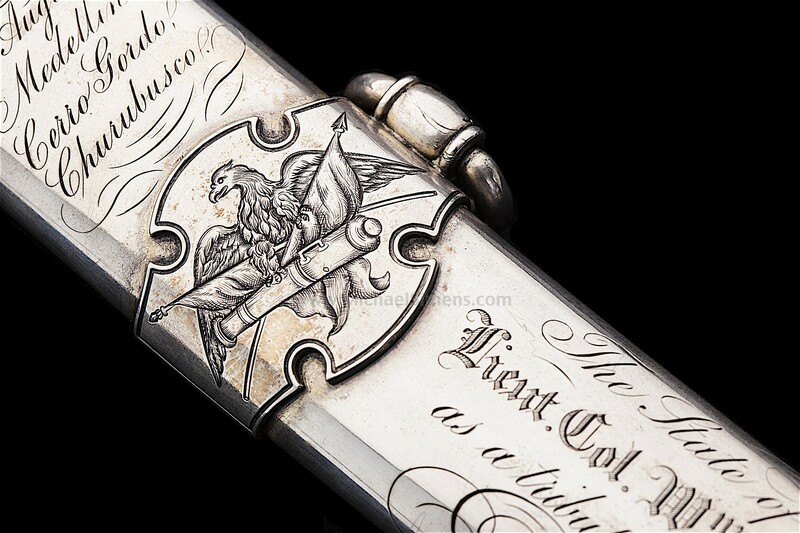 This may be the last sword that will ever be offered for sale that belonged to a Confederate Corps Commander and Lieutenant General. If you want to see another, you'll probably need to visit The American Civil War Museum in Tredegar, Virginia, (formerly The Museum of the Confederacy).